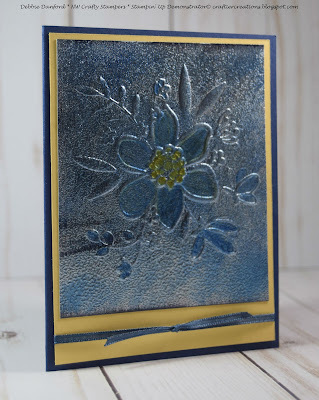 Today I am sharing a card I made using the Black Ice Technique. Original post link is here. But this one is more like the Blue Ice Technique. First I drug the piece of Silver Foil Paper with the Basic Black, then embossed it with the new Lovely Floral Embossing Folder. I then took a sponge and sponged with the new Blueberry Bushel lightly all over the foil piece. 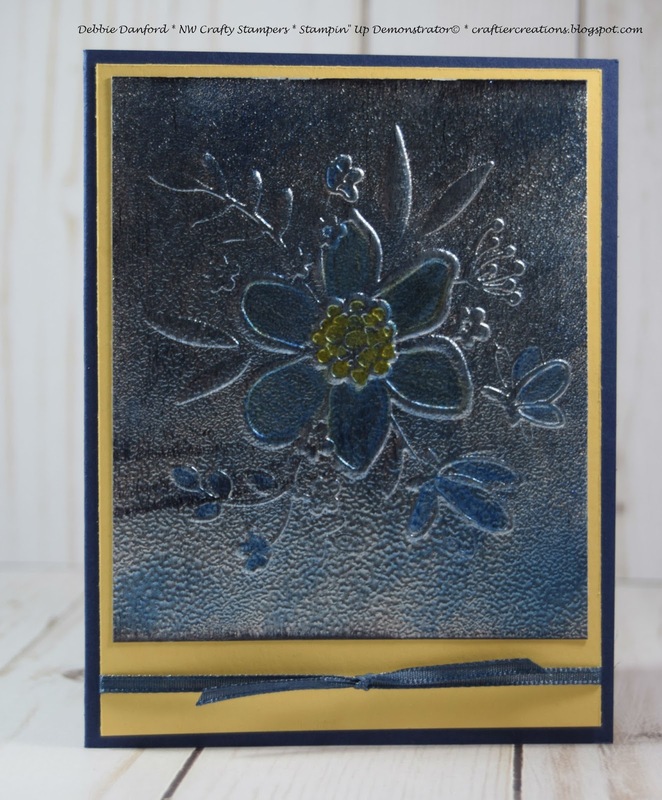 I also colored the inside of the flower with Night of Navy and the Daffodil Delight Stampin' Blends. Then heat set it with the embossing gun. Now do the final stem by dragging the Versa Mark and embossing it with clear embossing powder. Attach to a piece of So Saffron, then add the ribbon and attach it to the piece of Night of Navy. 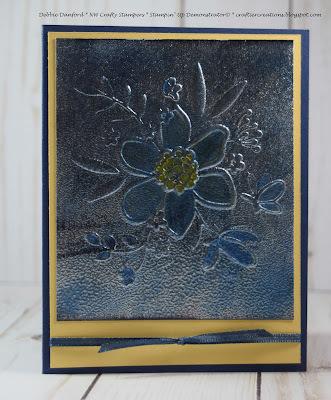 When I made this card I did not have any of the new ribbon colors, so I took the sponge and sponged the ribbon with Blueberry Bushel and let it dry. 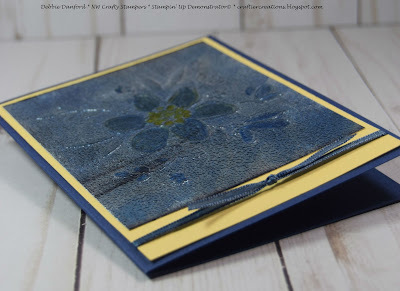 You could also use the Stampin Blends to do the same thing. 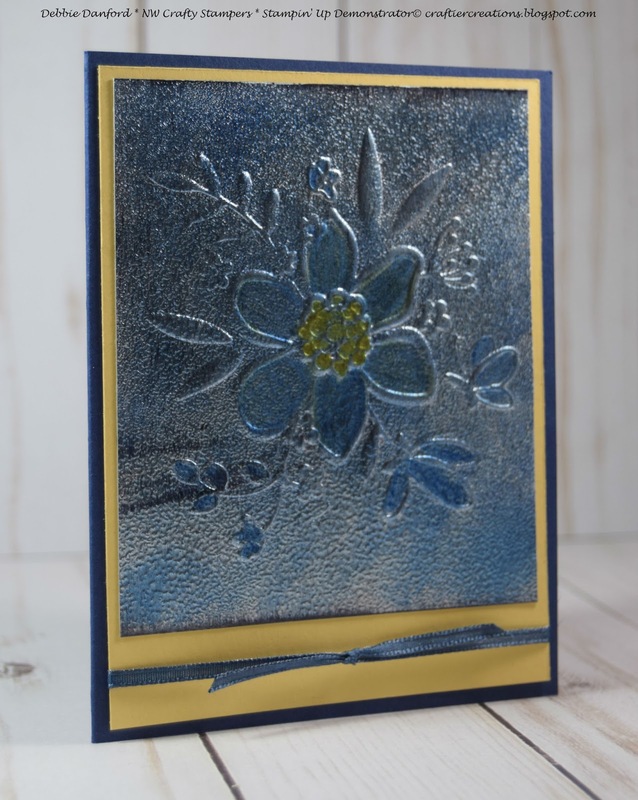 This Lovely Lace embossing folder is part of the new bundle you can now order. Stampin' Up is offering 3 different types of bundles, and you can also order the new In-Colors before the new 2018-2019 catalog goes live on June 1st. Click here to see all the options.